A crowd of 1,567 were on hand to see if the Poppies could get over the line but they were stunned inside the first three minutes when Jamie Willets thundered home a header from a Tom Tyrton corner. Both teams had chances with Paul White pulling off a couple of fine saves to keep Kettering in it while Alvechurch also struck the crossbar when Josh March took aim at an open net from 35 yards after a White clearance fell to him. Dan Crane also made some decent saves in the other goal as the Poppies tried to get back into it. But they did break through the in the second half when Craig Stanley got the final touch after Dan Holman had headed Gary Stohrer’s cross goalwards. As it stood, the point would have been enough as second-placed Stourbridge were held to a 0-0 draw at Needham Market. But Alvechurch put the title celebrations on hold when White allowed substitute Mitch Botfield’s close-range shot to squirm through his legs. 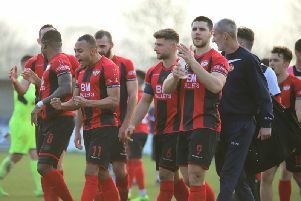 It all means that the Poppies now need just one point from their final four matches to clinch the title and they will hope to do it when they head to Halesowen Town next weekend. 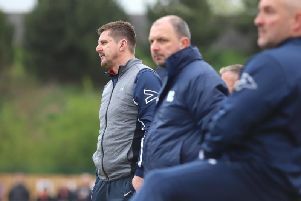 AFC Rushden & Diamonds remain six points off the play-off places in the Premier Division Central after they were held to a 0-0 draw at St Ives Town. There were limited chances for both teams with Tom Lorraine sidefooting over the crossbar for Diamonds early only. Jack Bowen went close after the break and St Ives almost snatched the points late on when Manashe Sundire saw his shot pushed round the post by Ben Heath. Diamonds are back at Hayden Road next Saturday when they take on second-placed Stourbridge. Corby Town secured at least third place in Division One Central as they claimed a 2-1 success at Aylesbury United. The Steelmen went in front after 34 minutes when top scorer Elliot Sandy found the net with a fine lobbed header. And the lead was doubled three minutes before half-time as Steve Diggin headed a cross from Joel Carta into the bottom corner. Sandy saw an effort tipped onto the post after the break but Aylesbury got back into it when Harry Jones scored. The woodwork denied Corby again when Connor Kennedy’s strike came back off the crossbar. And, in the end, it needed a fine save from Dan George late on to secure the win.